Above: Tasmannia insipida, copyright by Peter Woodard 2010. One of the Council’s bushland management officers has made a surprise but welcome discovery while undertaking bush regeneration in Pittwater. The officer recently came across the small native shrub species Tasmannia insipida – more popularly known as the pepper bush – while weeding an area in Bayview Heights behind the golf course. Since then, another pepper bush has been discovered at Church Point. Reserves & Recreation Manager Les Munn said the native pepper bush was previously not known to exist in Pittwater. 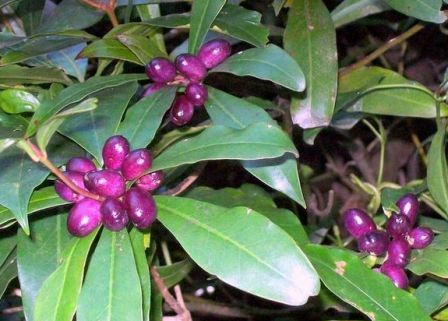 “There are about 40 species of this particular plant occurring in Australia, New Guinea and the islands off south-east Asia, but this is the first time we have recorded one in the Pittwater area,” he said. The native pepper bush originates from another species of plant found in Antarctica and is a shrub growing to around 3 metres high. As its name suggests, it was used by indigenous people as a spice because of its peppery leaves and stems. In Australia, it is normally found in moist areas of rainforest from eastern Victoria to northern Queensland. Mr Munn said it was an exciting find for the bushland management team at the Council. “One of our goals is to increase biodiversity in Pittwater and this is proof that our environment is becoming more diverse,” he said.